Goulds Water Technology is among the Top Water Pump Manufacturers in the US. Goulds Water Pumps highly outperform the pumps you will find in your local department store and is are very competitive with other leading brands. Price wise, Goulds Water Pumps are a little bit more than pumps from competitors like Myers and Sta Rite. That being said they offer World Class quality and performance. Lets dive into a few different types of Goulds Pumps so you can see if they are right for you. 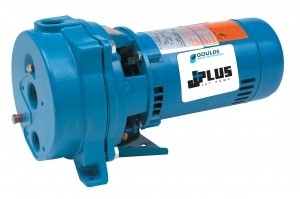 First off, we are going to take a look at the Goulds J+ Series Pumps. These pumps are great for your Home, Farm and rural homes. One awesome thing about Goulds J+ Pumps is that they are ready to take on both Deep and Shallow Well applications. Many pump brands like Myers and Sta rite have seperate models for Deep and Shallow applications. One of the great things about these Goulds Water Pumps is that they are relatively easy to service. This is important because many home users tend to be reserved to open up their pump and see whats going on. Sometimes your issue could be an easy fix! – They are designed to be able to pull apart without coming intact with your Piping. – They are Corrosion resistant!